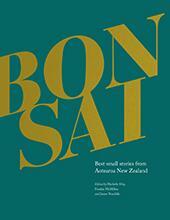 Bonsai brings together a pioneering collection of flash fiction and associated forms (prose poetry and haibun) from 165 writers in Aotearoa New Zealand, along with intriguing essays on this increasingly popular genre. In 200 small stories of no more than 300 words, where the translucent boundaries between prose and poetry are often transgressed, we discover a vast array of human experience. Here, children race snails, shoot tin cans, learn to fly, and look for Antarctica in a drain pipe, while Schrödinger’s cat dreams of life and death, a dog licks away a woman’s tears, and a peacock guards its human family. Family tensions spill over during trips to the beach, couples get together and fall apart, babies are born – or not born – and parents die. You might find yourself dancing like the cool kids, listening to a neighbour sing in the dark, or watching a tractor catch fire. There are perfect moments in miniature as dew falls on a spider’s web and strangers make eye contact. Michelle Elvy is a writer and editor of flash fiction whose recent work appears in New Micro Fiction (WW Norton, 2018). Among her many editing roles she is editor at Flash Frontier. Frankie McMillan has been called ‘our maestro of flash fiction’. Her book My Mother and the Hungarians, and other small fictions (CUP, 2016) was long-listed for the Ockham Book Awards. James Norcliffe is a poet, editor and writer for children. He is editor at Flash Frontier and has published nine collections of poetry, including Dark Days at the Oxygen Café (VUP, 2016).